The domestic 50 over competition starts next week. I would love to see all our under 19 play for their respective states. It will be great to see Shaw, Gill, Manjot, Abhishek, Nagarkoti, Mavi all back in India representing their state teams. This is a big tournlanet for Rishab Pant and many promising players knocking the door. The squad: Manoj Tiwary(captain), Sudip Chatterjee (vice-captain), Shreevats Goswami (wk), Abhimanyu Easwaran, Writtick Chatterjee, Anustup Majumder, Vivek Singh, Kanishk Seth, Ashoke Dinda, Sayan Ghosh, Mukesh Kumar, Aamir Gani, Pradipta Pramanik, Sumanta Gupta, Abhishek Raman and Ishan Porel. Pant needs better those List A numbers. Yeah I know list A is messed up but still should have better numbers. Delhi squad: Ishant Sharma (c), Pradeep Sangwan, Gautam Gambhir, Rishabh Pant, Hiten Dalal, Dhruv Shorey, Nitish Rana, Lalit Yadav, Unmukt Chand, Navdeep Saini, Kulwant Khejroliya, Subodh Bhati, Pawan Negi, Manan Sharma, Kshitiz Sharma. Delhi is the better of the 3 squads declared so far. their U19 pacer Lovnish Singh looks good. Where can one see squads announced ? he is still playing U19 WC, so, how could they pick him already. he will be picked once he is in India. One thing with these domestic tournament squads are that they are very flexible and easy on adding players in the middle of the tournament unlike in ICC tournaments. So teams would gladly add a new player in the middle of the tournament. I am sure there are rules to not adding random players to the squad but they let them do it most oftenly. Squad: Aditya Tare (captain), Dhawal Kulkarni (vice captain), Suryakumar Yadav, Siddhesh Lad, Akhil Herwadkar, Jay Bista, Shivam Dube, Shashank Singh, Eknath Kerkar, Aakash Parkar, Dhrumil Matkar, Royston Dias, Shams Mulani, Shubham Ranjane, Shivam Malhotra and Prithvi Shaw. Think BCCI needs to raise the profile of domestic ODi , make it interesting raise the game as such, our odi cricket is lagging n all good sides have moved ahead while we stagnate. no sarfraz khan in UP team ??? Rahul Chahar looks to have bowled well, conceding 30 from 7 overs and picking up the only wicket to have fallen so far. Any idea why he was jettisoned from the WC team? Anyhoo, look forward to seeing him in the IPL. Seems Ashwin is bowling leg spin. Any video?? 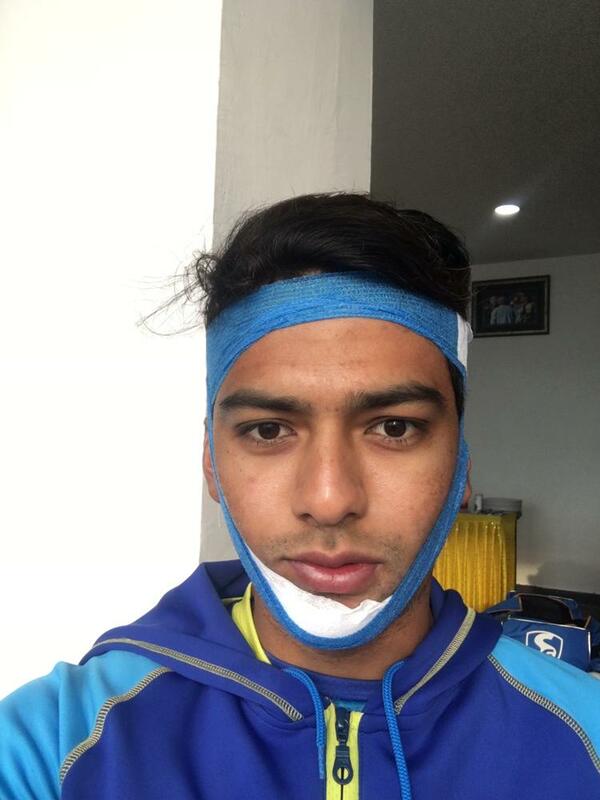 After 50 in the finals to help Delhi win the T20 SMA trophy, Unmukt Chand hit 116 today. The leftie Fast bowlers Khejroliya and Sangwan took 4 and 3 wickets each. Superb 100 by Vijay Shankar, hope he gets a look in soon over, especially with hardik not doing much. Siraj takes a fifer to help Hyderabad complete the win over Services. Rahul Shukla on his comeback game picked up 4 wickets vs Vidarbha. He didn't play any Ranji games probably because of injury. Is the Vidharbha pacer Lalit Yadav still injured? I read that unmukt batted with a broken jaw. Did any of the IPL team pick lalit yadav? Just checked the scorecard, 4 top order wickets and 1 tailenders wicket. Outstanding performance this. Though i never rated Services team much, but still its a good show. He got injured before the game during the net practice. Thats why the knock is even more special, and at the same time it is also surprising that he played even after being in that situation. Well done nevertheless, but he shouldn’t have played. Time to pen another autobiography, Unmukt? No need to mock the guy when injured. Sure the book thing was ridiculous, but he was young, and agents can be exploitative morons who misguide you. Let's leave him alone as he tries to do what Shikhar Dhawan managed to do. When is Sky is the limit part 2 coming out? I have an India trip coming up. I don't think that was the agents work.. I read and saw some of his interviews. He is the padaaku intellectual type so that probably came naturally to him . He was sitting on the bench reading a book even during ranji matches. Nothing wrong as long as he can get back on the trail to scoring runs. You need all kinds in the world. He is also a kind of character...the studious intellectuual kind. He is real and not the fake kind. He probably has a more fuller life that most other cricketers. All power to him to come out of the dark phase he has been having cricket wise. Yeah....but poor guy is coming back to form from a nightmarish phase in his cricketing life. Probably this is his make or break time. All the best to him . no. his name did not come up in auction. Ambati Rayadu is a Rowdy boy.